In 1949, Milton Smith published a short work of fiction that he entitled The Mystery of Element 117. The real element 117 is yet to be discovered – it's a blank space in the periodic table just below the halogens. Smith's 117, however, was a strange material that could be used to open a window to another dimension. He called it a magnetic monopole substance – one that instead of having poles, plural, like an ordinary magnet, had a pole. Singular. Now, whilst no reputable scientist would argue that a magnetic monopole could open an inter-dimensional portal, its existence isn't outside the realms of possibility and if recent reports are anything to go by, it could depend on an otherwise mundane metallic element that you can find skulking around near the bottom of the Periodic Table – holmium. 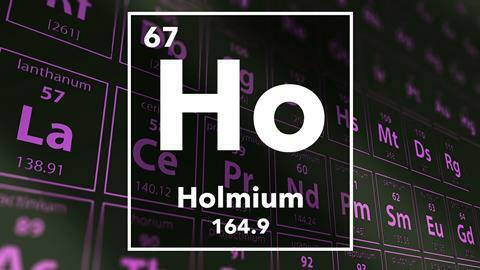 Despite having little else to shout about – bar a silvery sheen and a bit part in controlling nuclear reactions – holmium has some pretty fascinating magnetic properties. In fact, it has the strongest magnetic force of any element, albeit it as a paramagnet, which means it only becomes magnetic when it's sitting in an externally applied magnetic field. Perhaps most interesting are recent experiments that involved using holmium to try to find the mythical magnetic monopole. First though, let's create some context. As we know, the monopole has acquired the kind of fringe scientific status that makes it worthy of mention in science fiction circles – besides its appearance in Element 117, the author Larry Niven references monopoles in his 1973 novel Protector, where he imagines one of his characters mining shovelfuls of north poles from the rings of Saturn. But monopoles have also been the subject of much real scientific debate. The basis for their existence relies on work by the Nobel Prize-winning physicist Paul Dirac. According to theories, singular magnetic charges – monopoles – must exist in order to adhere to the grand unified theory of physics; to mirror the singular electric charges of elementary particles. 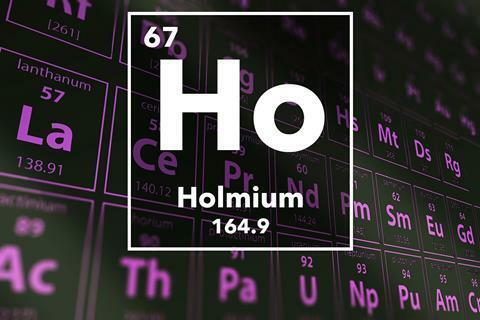 So that's about as glamorous and interesting as holmium gets a minor role in a science fiction story and in a search that may, for all we know, end in nothing but disappointment. And as the 56th most abundant element, it's twenty times more common than silver and hardly deserving of its "rare earth metal" label. In fact, in oxide form, it's used to colour cubic zirconia, the synthetic material that's sold as a cheap substitute for real gemstones. It is also found in very, very small amounts in the body and affects metabolism in certain bacteria, but it doesn't seem to be essential and no one really knows what, exactly, it does. 225Ac can be used as the active agent Targeted Alpha Therapy, also known as TAT,a technique for inhibiting the growth of secondary cancers by direct irradiation with nuclear material. And so an element discovered in the same mineral – pitchblende – which kick-started the whole science of nuclear chemistry, today stands at the crossroads of one of the most challenging of all medical disciplines – finding a cure for cancer.